Most of those so-called middlebrow readers would have readily admitted that the Iliad set a standard that could not be matched by What Makes Sammy Run? or Exodus. But any reader with common sense would also understand intuitively, immediately, that such comparisons are false, that the uses of reading are vast and variegated and that some of them are not addressed by Homer. I think most avid readers will recognise themselves in many of Anna Quindlen's recollections. Haven't we all walked down the street reading the last pages of a book we just can't put down? Haven't we all escaped into the pages of a book rather than deal with real life? It was fun to read about her journey but what this book did, was to encourage me to look back at my own reading history. I was the teenaged reader of E. Nesbit and Jane Austen, of Mazo de la Roche and Charles Dickens, of Agatha Christie and Robertson Davies and the Brontes. If I'm being completely honest here, I also spent more than one evening with books from a teen romance series called "First Love at Silhouette" which included the baseball-themed Short Stop for Romance and the tennis-themed Courting Trouble. My siblings and I used the library frequently, and my parents were always working through some non-fiction that held no interest for me (political biographies or social histories). I have never been a prolific reader; I have always been slow and plodding, but I finished my degree in English Literature, and then I worked for some years (whilst pursuing my studies in Art History) in libraries and independent bookshops where I was in charge of the children’s books. During that time (pre-children-of-my-own), I spent most of my time endeavouring to read all the children's books I could. I discovered all the classics I had missed, and all the new authors of which I had never heard. I became fascinated with historical Canadian children’s fiction, and Sheila Egoff’s critical work in the field. When I entered the next phase of my life - The Mothering Years - I was able to put all that knowledge to good use with my own children. Sharing all my own favourites and finding even more new books together has been one of the truly wonderful aspects of parenting for me. My focus was on their reading, and because I chose to read them books that satisfied me as well, my own fiction reading declined. For the first time in my life I began to search out non-fiction books. I needed to find the answers to the questions presented by daily life. So, I read parenting books, philosophy of education books, cooking, sewing, lifestyle books, books about simple living, books about yoga, illness and nutrition, books about travel and learning a new language. I am now recognising that I have settled into a new phase in my reading life, and this blog is part of that. The search once so pressing for practical solutions to daily life seem less urgent. I am no longer focused so much on the simple answers to the simple questions (What do I make for dinner tonight? Which is the best hike to tackle with a three year old?). Now that the girls can (and do) read for themselves I find myself once again free to pursue my own interests. I now find that I am looking for the complex answers to the complex questions of life, and the books to which I am drawn are invariably authors I encountered years ago and whose work I have not finished exploring. I first met Aldous Huxley, Jane Austen, Robertson Davies, Josephine Tey, Orwell and Margaret Laurence when I was in secondary school; Margaret Atwood, F. Scott Fitzgerald, Alice Munro, George Eliot, Carol Shields, Hermann Hesse, Michael Ondaatje, Turgenev, and Hardy continue to appeal from my university days and all of these authors and more continue to speak to me. I have loved being introduced to new authors through blogging and have found so much inspiration from bloggers. I had never read Rumer Godden's adult fiction, Willa Cather, Dodie Smith, Beryl Bainbridge or Colm Tóibín's work before reading blogs. For seven years I have been dealing with a chronic physical disease which affects my daily life. I am fascinated by the mind-body link I have experienced during this time, and my fiction-reading has played a significant part in my treatment. I have seen incredible links between my health and the books I am reading; the body follows where my mind leads. I choose my reading very carefully especially when I am having a flare-up. I will write more about this aspect of my reading life soon. While I like my non-fiction simple and informative, I like my fiction deep and nuanced. I read non-fiction to learn what I do not already know. I read fiction to put words to the truths I feel deep in my soul. I like my non-fiction to-the-point and direct, well-organised and fast. I like my fiction with as many interpretations as there are readers, books that reward the re-reader, and the close reader. I search non-fiction for the simple answers. I search fiction for someone else's answer to the big questions that I can weigh against my own convictions. I like writing that is as complicated, and interwoven, and multi-layered, and symbolic, and challenging as life itself. I love reading. Hi Lee – Anne – I have been reading some of your posts and I must say that your blog is very impressive. Great commentary in this post especially. 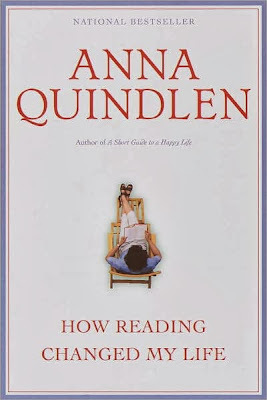 I can really relate to many of your experiences and perceptions about reading. This also sounds like a book that I would really l as I am very partial to books about books. Thank you, Brian. I appreciate your comment. I usually love books about books too. They make me feel as though I've met a kindred spirit when the author loves books for the same reasons I do.